So this week we we were in Greenvale Infants School studying the differences between dances from the North Eastern (in relation to England) and South Western parts of the world as part of their geography workshops. The whole school was involved with a series of classes held over two days in which we learned elements of a Russian and Hungarian dance notably the Sappoggi and Czardash respectively as well as elements from the Dominican Republic and Cuba with our Merengue and Salsa dance steps. The aim was to compare the two styles, and actually as a dance teacher this was quite interesting for me too. I noticed that the basics were very similar… the Merengue two step was very similar to the Czardash, and the basic solo Salsa step a much lighter version of the Sappoggi step. So we then looked at the differences. A big difference was in costume… with the Russians and Hungarians wrapped up nice and warm agains the elements, and the Latin Americans wearing… well very little actually! I guess being so hot, warm, cosy clothing would not be conducive to dancing. I also noticed that possibly as a result of this, the slavic dances were very much about the costume… such as the dusting snow off the boots in the Sappoggi or the showing of rings on fingers in the Hungarian dances. With Latin American dancing it was still about the costume to some extent with fabulous headdresses or feather skirts being shaken and shimmied, but also very much about the movement of the body and arms. I will say that much as I love teaching the Hungarian and Russian dances, as they are so strong and proud, I found that the minute I put on a spot of Latin music, the whole room erupted into wiggles! It was fantastic! I wish I had had a video… something about this music just makes you want to wiggle. Which the children really enjoyed. What a great fun way of learning about two different parts of the world. All For Fun’ is a summer holliday activity club for young people aged between 5 – 18years. 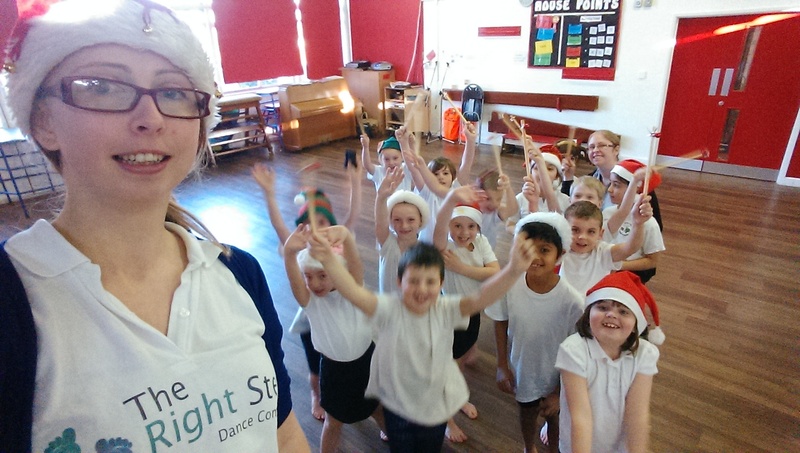 They run Monday – Wednesdays for three weeks and provide activities such as arts and crafts, football and the week TRS went; dance. 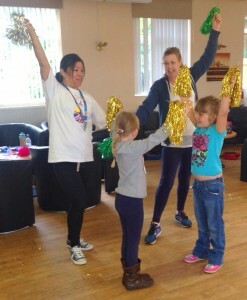 I (Sophie) went in on Monday morning 27th July to liven the club up with some cheerleading! The children were a bit apprehensive at first and were reluctant to join in but once we had warmed up and the glittery pom poms were handed out there was no stopping them… or the staff! We learnt the basic arm positions which is key to any cheerleading routine and to help us remember them we played a game. Now the ice was broken we could start to get funky and we learnt a routine to the chart hit ‘Bills’. After a quick refreshment break and a game to get everybody back together we learnt another key aspect to cheerleading which proved to be a lot of fun; assisted jumps and lifts. With all the staff involved we could send the children flying into the air and added this element into our routine. 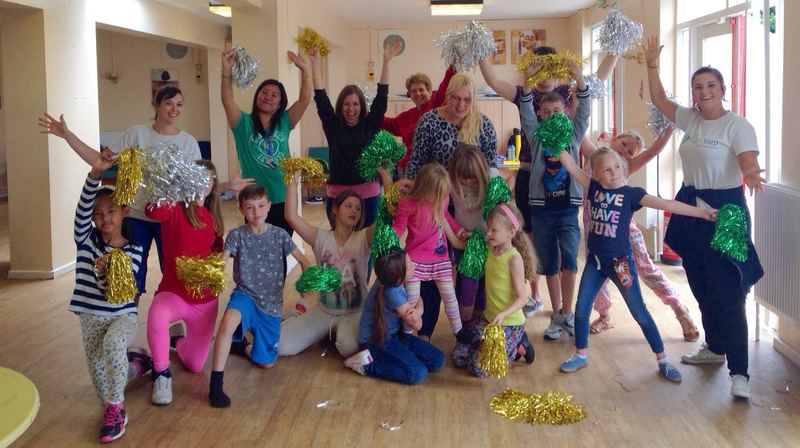 During lunch, word got round how fun cheerleading was and the last session we had double the number of cheerleaders! We started with a quick, fun warm up, taught a routine to verse and chorus to the ever popular ‘Uptown Funk’ then it was time to get creative! 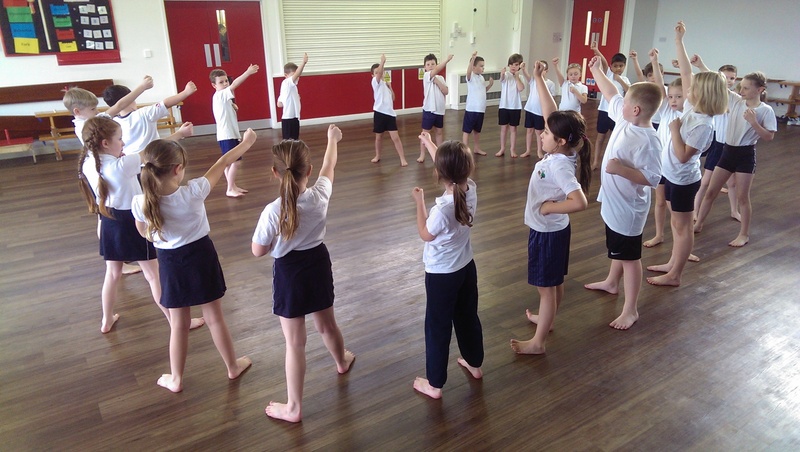 In small groups they worked to create their own cheerleading routine that had to include everything they had learnt today – arm positions, formations, assisted jumps and lifts. The results were fantastic! Each group performed one at a time to show off their routine and each one was unique, lively and exciting! To finish the session we cooled down with some stretches and I left the centre with the children excited for tomorrow’s Street Dance workshop with Shanice. 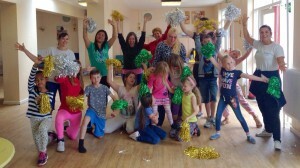 I couldn’t wait to get back to Querns on Wednesday 29th July and see what they were up to with Shanice on Tuesday and collaborate Cheerleading and Street Dance. And what a day we had! It was brilliant fun from start to finish! Shanice started the session with a top to toe warm up to get everybody moving. Then we started to watch each other and follow various leaders around the room to wake up our brains. As there were quite few new faces there I hadn’t met on Monday we handed out the pom poms and used them for Name and Shape as an ice breaker and to refresh my memory of who’s who! Once we were all thoroughly warmed up we explained the main aim today. This was to create a dance piece that we can perform at the end of the session. We had chosen ‘Shake it Off’ by Taylor Swift which came from a suggestion by Jessica on Monday. We started off by teaching a cheerleading phrase for the verse, using the pom poms and arm positions. 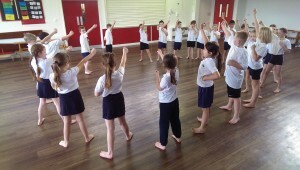 Then street dance came in and for the chorus we learnt a street dance phrase. After practicing and putting the two very different sections together we moved on by incorporating a formation change which cheerleading is known for together with street moves. Shanice and I as leaders had great fun playing with this idea and the dancers were brilliant at doing anything we asked! We decided on a cannon arm phrase with the dancers in lines, going in different directions so we didn’t make it easy for them! However, the next section they were in charge! 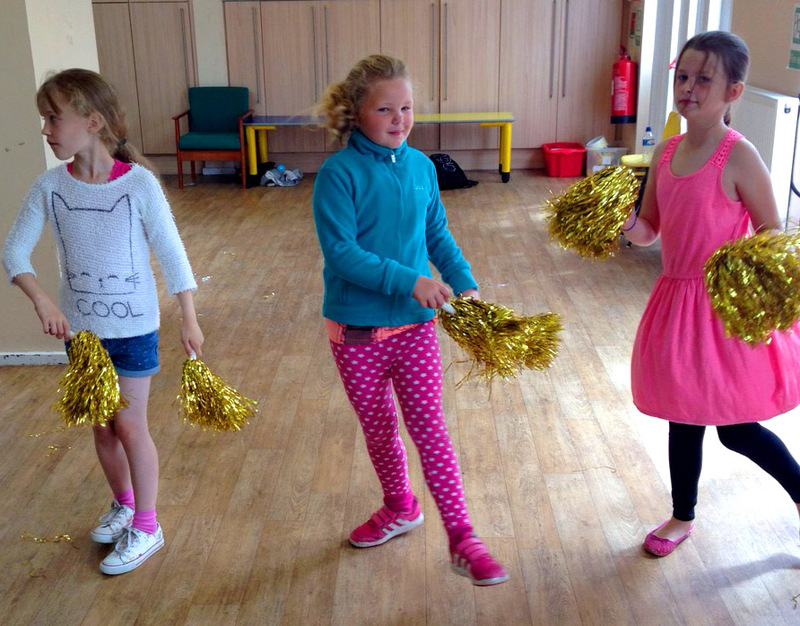 In small groups we asked them to come up with a short routine using street dance and cheerleading actions. Everybody got stuck in and worked together in their group to again produce something fun and creative. In fact they were all too good to have perform at the same time in the final piece so we decided they should take centre stage a group at a time to really show off their work! After lunch it was show time! everybody who hadn’t been involved with the workshop gathered at the front and the dancers took to their starting positions. we gave a short speech about what we had been up to and introduced the Street Dance and Cheerleading collaborative piece. Each dancer put 100% into their performance and smiled as they did so, especially when it came to their group to perform. At the end they received a big round of applause and cheer for their hard work and a participation certificate from the centre. I would like to say thank you to all the staff for being really enthusiastic and participating to help encourage the children. I really enjoyed working with you all and meeting the brilliant young people. Yes May is here already!! And we had a fantastic May Day here in Medway. Rochester as always hosted the Sweeps Festival with hordes of Morris Dancers from around the country gathering to show their best. We had clog dancing, Morris Dancing… sword dancing, and one set of Morris Dancers were really getting quite lively with whacking their metal poles together! Very dramatic (hope there were no squished fingers). In light of this, we thought we would bring a hint of May to our Active Armchairs and Social Dance Classes this week too. 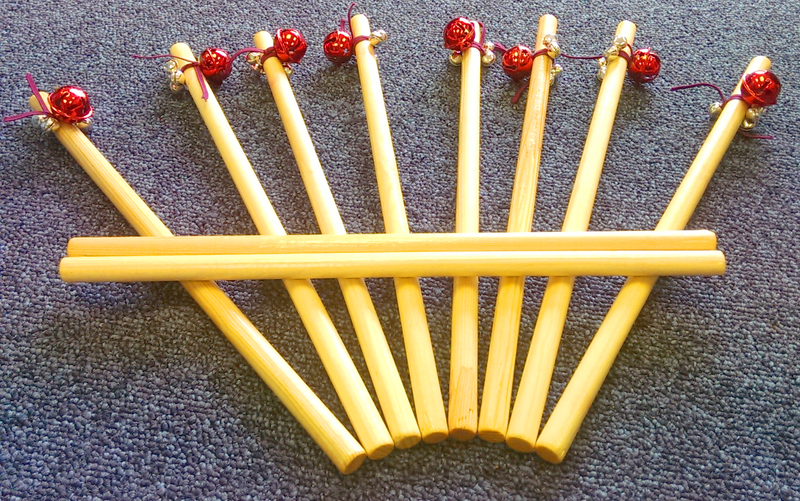 First up was Rochester Care Home where we had quite a few participants, so each one had a single jingle stick. 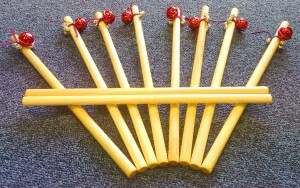 The participants helped create our Morris Dance trying out their own ideas with the sticks and then we danced the dance. It was great! Even people who don’t usually join in, couldn’t help but take part as the bells just begged to be jingled. Jessie really enjoyed it, as being partially sighted, she found the added sound of the bells encouraged her to join in as well. At the end I went up to each participant and we did our own version of the stick hitting element of Morris Dancing, which I realised was particularly good for this group who sometimes struggle with coordination. The next outing of the jingle sticks was with our Monty’s Movers… a lovely group of ladies at Montgomery Court Assisted Living. This time, with a smaller group, we were able to have two sticks each, so much clacking of sticks was undertaken throughout the dance. What a great week for our props basket. Talking of which, we have realised just how many props we have, so do check out our facebook page for future tales of how we incorporate props into our dance classes to add a little flavour and fun. There has been much publicity recently regarding the increasing of our life expectancy in light of which, we thought we would also look into the recent announcement that one in three children born today is likely to live to 100! In fact this statistic was first announced by the ONS (office for national statistics) back in 2012. Meaning that some of our teachers already have students that stand a one in three chance of seeing their hundredth birthday. There was quite a focus on the wealth aspect, and how people might have to work for longer or pensions last for longer, however as a dance company thought we were in the perfect position to focus on the health issue. It is all very well living to a hundred, but we want to live well for those hundred years, not spend the last few decades struggling with health issues. Thankfully further research has shown that regular exercise can help prevent or delay the onset of many diseases that can show up in later life, such as diabetes, heart disease, osteoporosis and lung problems. Here is just one article of many about the health benefits of exercise. As a result, we have decided to focus on fitness in our chlidrens’ classes. Habits learned early can stick for life, so why not instil some healthy habits? As pension plans are best started young, why not start your child’s health pension really young? Whilst this is not simply about obesity, excessive weight gain has been shown to be one of the major health issues in children in middle childhood, with this also potentially leading to a number of serious conditions in later life. (Boyd & Bee, 2009). And hence our decision to focus our current dance classes on fitness. Of course In reality, any well-planned dance class is going to help improve fitness. They would all include some gently increasing levels of cardio vascular exercise to warm up, toning and dynamic stretching exercises to prepare muscles for dancing, and further stretching cool them down afterwards. And the dancing itself is a lively activity, so it doesn’t take a huge leap of imagination to shift the focus a little more towards the fitness aspect of our classes. Already major dance educators such as the RAD (Royal Academy of Dance) have included longer jumping sequences in their new syllabi, realising not only the importance of increased cardiovascular fitness but also the fact that modern children are more likely to get their most regular exercise through organised classes as opposed to playing outside in their own time. Here is quite an interesting article on this by the BBC. So… our dance teachers will be planning their classes with this in mind, increasing the cardio-vascular elements of their classes just that little bit more. This way the children we teach will be getting fitter without even realising. Learning healthy habits in a fun way that will hopefully help them lead a healthier and livelier later life. Ahhh technology can be a wonderful thing, and when it merges with art, it can be amazing. 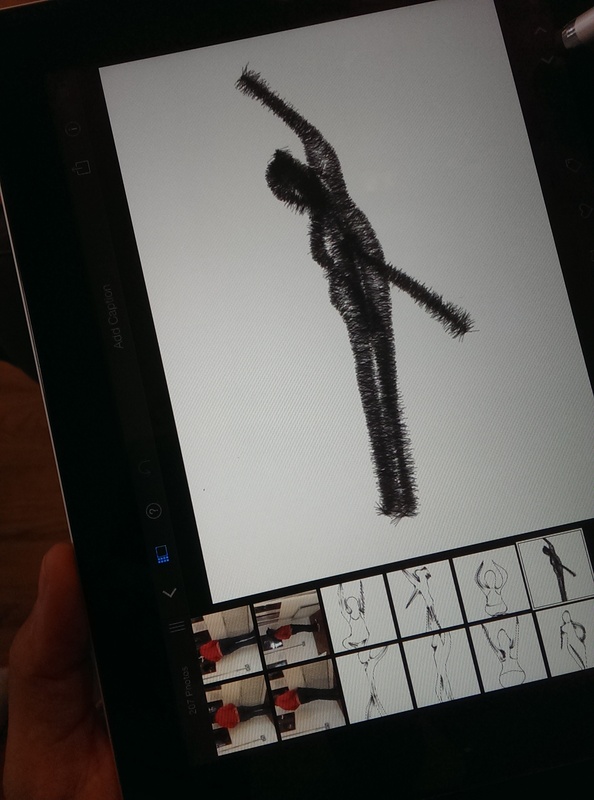 We have already encountered this with our Croquis Events where artist Ray Eden used his iPad to create some fantastic sketches of our dancers. And now, there is a nifty little app that you can get called Dance Writer which can put text into dance… and the results are really quite beautiful! As a community dance company, we like to share and work as a team. So every six months, we do exactly that… share our ideas. And what a great idea that is. Last week we had our Active Armchairs sharing session. Here we share ideas for props, choreography, exercises as well helping each other with any issues that may be going on with their classes. First up was Alix who shared some great stuff… I particularly liked her hands and dexterity exercise. Whilst we do use an arm movement exercise in each Active Armchairs class… I don’t really focus specifically on dexterity for a whole dance. This was great, she included turning palms towards and away (great for the wrists) and finger to thumb work… all very good for maintaining finger strength and mobility, which can be very much compromised with sufferers of arthritis and rheumatism. Rebecca shared her fantastic new ribbon stick props. Having made them herself using dowling bought at the local DIY store, and ribbons from eBay (we love eBay! )… she had created a whole dance especially for them. 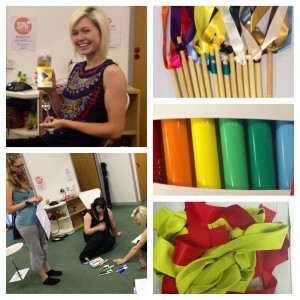 They also have the potential of doubling up as rhythm sticks too… simply remove the ribbons and you can tap out a beat. Great fun to be had there! Georgia shared her ball props… a bag from the pound shop, again great for dexterity with a little fun thrown in. Each participant has a ball, they can then squish the ball between thumb and forefinger, roll the ball along the forearm (doubling as a gentle massage as well) or even throw up and catch, in order to maintain reactions. I shared my idea of using lycra strips kind of like the giant scrunchie, but with a little more flexibility if the room doesn’t lend itsel fto a straight circle… we could have the strips crossing the room, forming a web, linking particular people… and so on. I also shared my “When You’re Smiling” dance… which seems to go down very well with most of my participants. What a great way to freshen up our classes and learn some more tips. A most productive morning. To finish off, we had a spot of brainstorming over a particularly challenging class that has cropped up recently. A good way to re-think our class management techniques. We also found out that since Active Armchairs began in 2010 there have been over 4000 Active Armchair experiences provided. How fantastic. I think our Sirens’ storm conjuring was just a little too successful, having created a whole pile of grey clouds for our dress rehearsal yesterday! It was a cold and sorry group that walked the promenade, with drizzle threatening, for our final run through in full costume and make up. And our final practice storm calling must have been even more successful as later in the day, thunder rolled around Rochester with snaps of lightning splitting the sky. Oops… sorry chaps. This morning we woke to mist! A hazy blanket had wrapped around us through the night, so we crossed our fingers and hoped that the July sun was strong enough to steam it all away for our actual performance. We Sirens gathered in our home for the day (The Right Step offices) and proceeded to warm ourselves up and prepare for the performance ahead. Below us by the pier, the River Festival was starting to take shape; guys on jet skis looped the loop, ships fired out great blasts of water and an amazing chap was defying gravity with an incredible water jet pack system allowing him to fly like Iron Man using water for propulsion. We saw the little AMG Funky Ballet dancers performing their hearts out on the pier itself as part of the Big Dance weekend as well as Ginny and Maude taking their delightfully quaint trip to the seaside. A true medley of dance genres unfolding beneath us. Meanwhile we were being transformed from mere mortal dancers with the usual aches and pains into our mythical alter egos… the Sirens. 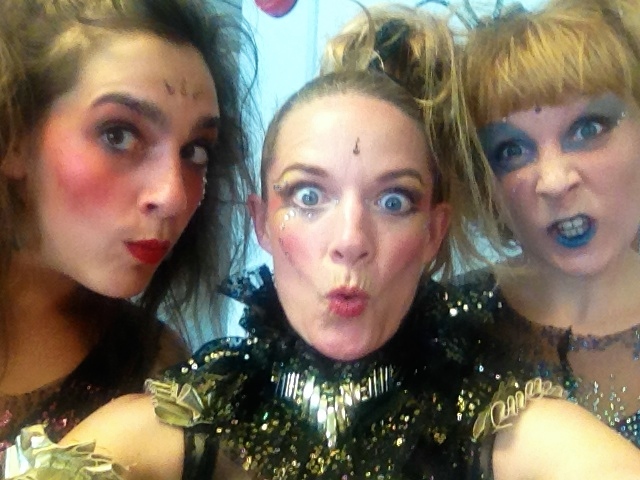 With every layer of lace, every brush of make up we were venturing deeper into our characters. Finally, transformation completed, it was time for our promenade… we were being marched to our rock… where we were to be banished for eternity. With the heavy drums and mournful singing from our leaders, it was time to walk. 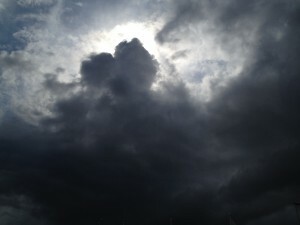 And amazingly, the sun had started to creep through the grey… perfect timing. The performance tells the tale, how we emerge, seduce, call the storm and then recover the next day only to realise that this is it, we are to repeat the story over and over! We are stranded forever, never to love again, never to feel again… banished to our rock. A tragic tale indeed. And true to the story, we repeated it all again back on Sun Pier for our second performance of the day. So for someone who lived in the Sinai desert, you would have thought that I would know how to protect myself from the sun’s rays. But… no… after our first day’s rehearsals in yesterday’s glorious sunshine, there was a distinctive glow to my face and shoulders by evening. 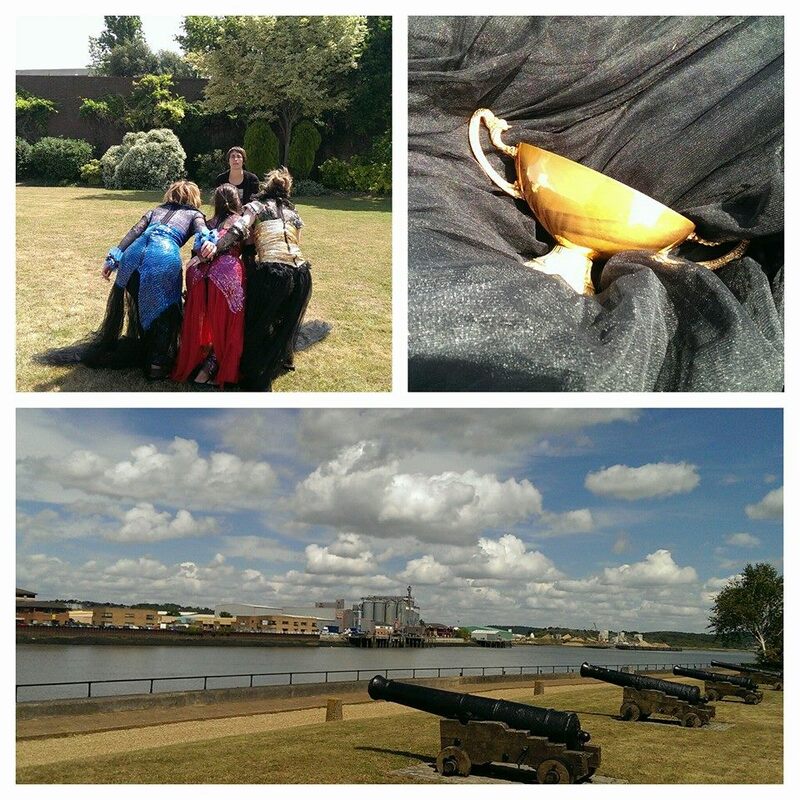 So… day two saw us all slathered with sunscreen! Of course the clouds knew this, so decided to fill the sky for us… haha one surplus bottle of factor 20 now sitting in my bag. Hmmm… me thinks we may have been a little too successful with our conjuring up of the clouds yesterday. Day two saw us finishing the last two chunks of choreography. Sophie had her spritely, child-like section to work on and I my emotional realisation of our plight. Jacob’s dramatic music combined with Lorraine’s insightful words and my over-active imagination resulted in me genuinely feeling quite choked. All ready for the dress-run tomorrow! Day one of our rehearsals for the Big Dance Sirens of Cetham event at the weekend and we were fittingly, by the water. The Sirens and our lovely choreographer Lorraine gathered on the grass by the Mayor’s lawn to begin the creative process. Gathering our thoughts on our terrible situation… banished at sea to a lonely rock from which we are to lure unsuspecting sailors to their death for eternity. So we worked our bodies into seductive mode, “singing” the siren’s song through dance… me the matriarch and probably the one most aware and devastated by our current situation together with my fellow sirens, the spritely, young, blue siren and the ultra seductive, red siren. Moved by the dramatic music created by Jacob Bride we breathed our breath and worked our bodies into the movements… early days yet… more to come tomorrow.